Shopping in Boston can be a fabulous adventure, from the upscale boutiques of the Back Bay neighborhood to the bustling stalls and shops of Faneuil Hall Marketplace. To make things easier on your pocketbook, there’s no sales tax on food items or most clothing. Need souvenir ideas? Popular buys include Harvard and M.I.T. sweatshirts, Red Sox paraphernalia, “Cheers” mugs, and anything with a lobster logo. Read on to learn where to shop in Boston. Here are the top places to shop at whenever you are in Boston. 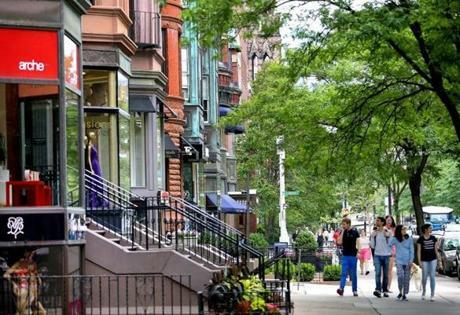 Newbury Street – Near the Common are the expensive shops of Newbury Street, which is nirvana for shopping in Boston. More stores, including Neiman Marcus, can be found a few blocks away in the mall settings of Copley Place and the Prudential Center. Beacon Hill – For distinctive, one-of-a-kind antiques and contemporary crafts, we love the Beacon Hill area’s boutiques. Faneuil Hall Marketplace – The Faneuil Hall Marketplace is a lively historical spot with street performers, a huge food court, restaurants, bars, and lots of shopping opportunities. This is a great place to pick up souvenirs for the folks at home. Sample an authentic cup of Boston clam chowder, watch a musical performance, and then tour the historic neighborhood. Boston Public Market – Another popular spot to pick up local items is Boston Public Market, where some 40 New England farmers and food vendors offer baked goods, cheese, produce, and specialty foods. Downtown Crossing – Boston is a city for walkers, and Downtown Crossing is one of its most popular pedestrian malls, with shops selling clothes, books, souvenirs, and much more. Harvard Square – In Cambridge, don’t miss Harvard Square. There are about a dozen bookstores and newsstands here (including the famous Harvard Coop), plus indie clothing stores and a variety of other boutiques. Wrentham Village Premium Outlets – About half an hour south of Boston is Wrentham Village Premium Outlets. Home to nearly 200 stores, this the place to visit if you’re looking for quality items at a great price. At Boston Chauffeur, we know a little something about the Boston area and would be happy to give you a guided tour in one of our luxury vehicles anywhere in New England. Just give us a call at 978-921-4334 to help you determine the best vehicle for your excursion.